The Bronze Pomeranian Dog Sculpture by Metropolitan Galleries was cast by the traditional, Lost Wax Bronze Casting method. 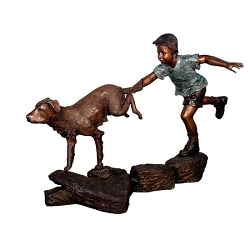 This labor-intensive and time-consuming method of casting bronze statues, ensure pristine quality and vivid detail. Metropolitan Galleries Inc. Offers a large selection of bronze statues and bronze fountains perfect for indoor and outdoor use. This Bronze Pomeranian Dog Sculpture features intricate, hand-forged details with a beautiful brown, fire-applied patina. We proudly ship to all fifty states. The Bronze Pomeranian Dog Sculpture is hand-crafted when ordered and ships within 4-6 weeks.